Another super premium packaged root beer. There’ve been more of these as late, and I for one am happy to see root beer taken to the next level. This is from Rocket Fizz, maker of many celebrity root beers of varying quality. The bottle size and wax seal immediately made me think of Indian Wells Special Reserve. They actually are both made at the same place, but are unique recipes. Plus this has shiny gold wax. 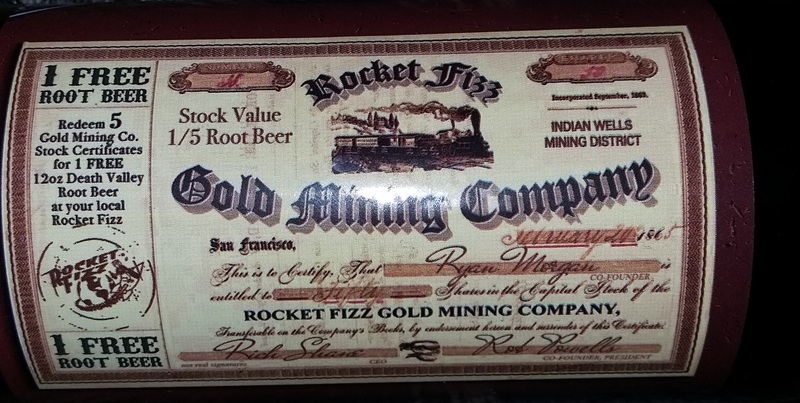 In keeping with the old-timey feel, they have stock certificates in the Rocket Fizz Gold Mining Company. Each stock certificate is worth 1/5th of a root beer, a Death Valley Root Beer, which is also made by Indian Wells, but well, um, isn’t a root beer worth getting at all. So, yeah, stock in a worthless root beer is available as part of the gimmick with this. But what about the brew itself? It has a rich creamy Body with distinctive, yet not overpowering licorice. Like, just enough that I still like it, which isn’t a lot. There is a minty hint to it as well. The Bite could be spicier, but it is present. It’s mild and on the smooth side. The Head is most excellent. Very tall and foamy and just perfect. The Aftertaste is a sweet, spiced vanilla. Very pleasant. It’s a complex and yummy brew, though not as good as the Special Reserve, it still squeaks by at a Seal of Approval, just barely. I was quite on the fence with this, but the second bottle won me over. Who cares about those stock certificates, just give me more of this. Though, at the price point ($7/bottle), I doubt I’ll be buying much more. See how it rates against other root beers. Another brew from Rocket Fizz. Those makers of strangely themed craft sodas are at it again, this time, rather than go all celebrity themed, they decided to go hunting themed. Finally, a root beer that embraces the most glorious sport and pastime that is hunting. But you can tell that they are true hunters, for they’ve named it Dad-Gum-It! in a clear reference to a frustrated bird hunter. Who’s name is Ryan if the hat is to be believed. I’ve been there Ryan, more times than I care to admit, after burning through all three shots at a single pheasant flying straight away from me. How could I have missed? When just yesterday I was able to shoot quail. QUAIL! They’re like a quarter of the size and move faster. How could I have missed something so much bigger and slower?!? Dad-Gum-It! … well anyways, root beer. And butterscotch root beer. I do like me some butterscotch. 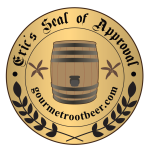 Will this be the Seal of Approval brew to console my crushed ego after future bird hunting failures? The Body is dark and spicy with licorice featuring prominently and some wintergreen as well. I also taste a distinct lack of butterscotch. The Bite is solid and strong from spices and ample carbonation, a little too strong. The Head is excellent! It’s there as long as you drink it (within reason). The Aftertaste is a little wintergreen and licorice. Also, no butterscotch. Dad-gum-it! They tricked me. I was promised butterscotch. Maybe that’s the whole message of this brew. That what you really want will escape you. Ryan, for all his prowess, was unable to get his birds just like Rocket Fizz, despite their vast collection of soda ingredients, was unable to actually put butterscotch into the root beer. In the end all you’re left with is bitter dissappointment, much like a failed hunting trip. I don’t recommend either. See how it rates against other root beers.